There are many excellent books on the subject of mosaics. 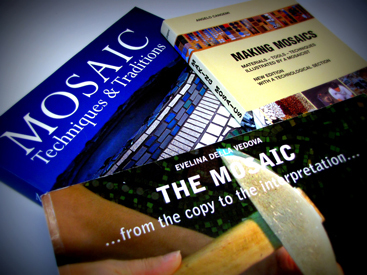 di Mosaico offers three of the best - books that provide thorough explanations of the mosaic making process. The books we offer target a range of audiences. "Making Mosaics" is a wonderful introduction for beginners, while "Mosaic Techniques & Traditions" and "The Mosaic ...from the copy to the interpretation..." are aimed at more advanced mosaicists.